Giani Bernini threatens to put us all to sleep with its traditional Annabelle tote. It's not that there's anything wrong with the Annabelle. Its pale signature print is a subtle and inoffensive way to brand the bag. Its trim and handles are made from real leather, and its shape a true classic. But goodness it's boring. It's the right size for everyday use, not too big and not too small as Goldilocks might have said. Its interior is well appointed with an array of pockets, and there's another one on the outside for items we need on hand. There's even a cute removable change purse inside, which could double as a clutch. A sunken zip keeps that pouch and our other goodies safe and secure. It's even got metal feet to protect its base, which is virtually unheard of at this price point. The Annabelle has an awful lot going for it, not least of which is its $75 price tag. But it's got no flair, no style, no razzamatazz, and no pizzazz. With that elusive X factor missing, this Giani Bernini tote is really a hard sell. 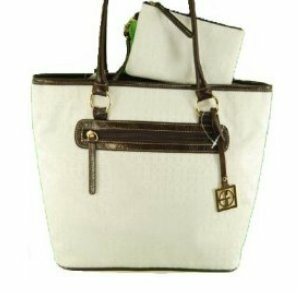 The Giani Bernini Geraldine bag, a great alternative to this tote bag.